My last day in Detroit started at the corner of Michigan and Trumbull…a site very important to Detroit sports fans. It is the site of the old Tigers Stadium, home of the Detroit Tigers baseball team. 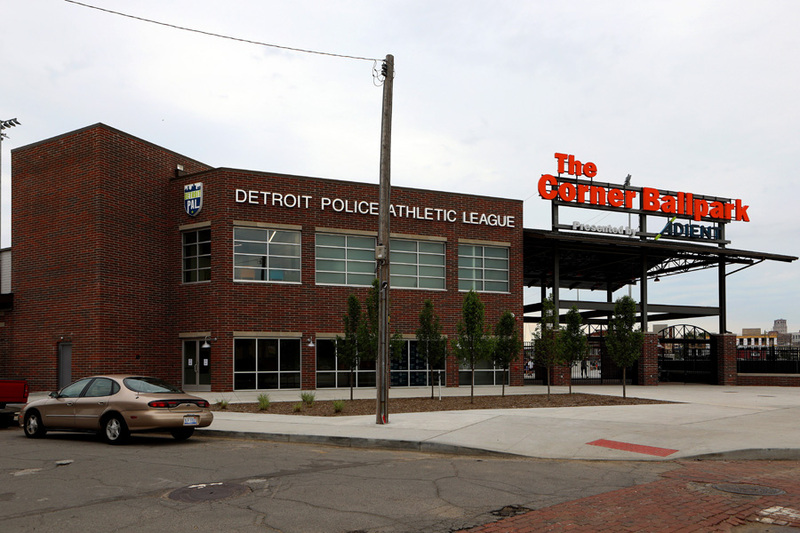 It hosted Detroit Tigers baseball from 1912 to 1999, as well as Detroit Lions football from 1938 to 1974. 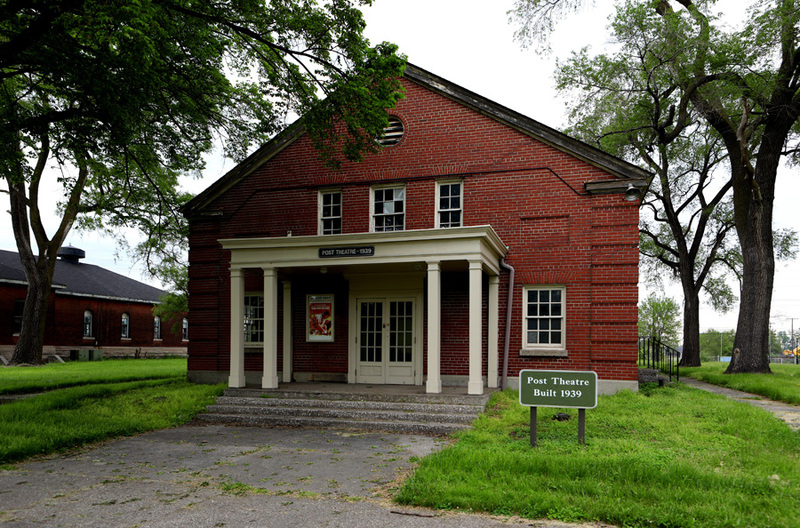 It was declared a State of Michigan Historic Site in 1975 and has been listed on the National Register of Historic Places since 1989. The stadium was nicknamed "The Corner" for its location at Michigan Avenue and Trumbull Avenue. The last Detroit Tigers game at the stadium was held in September 1999. In the decade after the Tigers vacated the stadium, several rejected redevelopment and preservation efforts finally gave way to demolition. The stadium's demolition was completed on September 21, 2009, though the stadium's actual playing field remains at the corner where the stadium once stood. 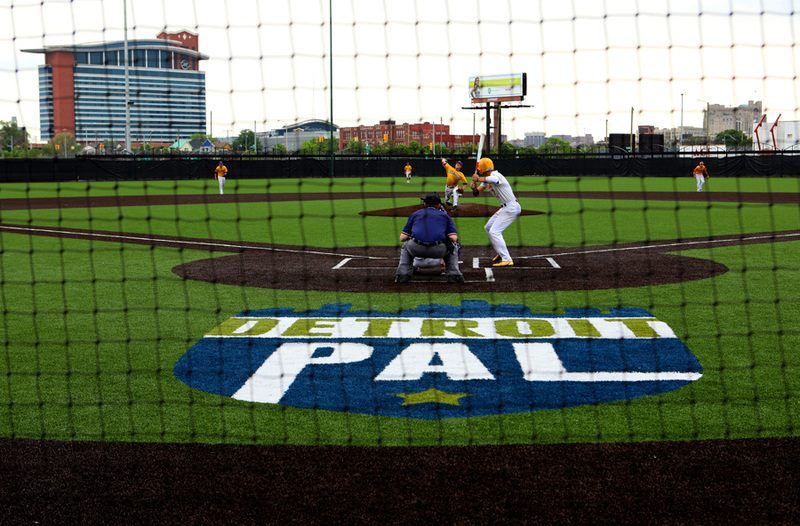 Since the spring of 2010, a volunteer group known as the Navin Field Grounds Crew (composed of Tiger Stadium fans, preservationists, and Corktown residents) has restored and maintained the field. A plan to redevelop the old Tiger Stadium site would retain the historic playing field for youth sports. In partnership with the Detroit Police Department and community volunteers, Detroit Police Athletic League builds character in young people through athletic, academic, and leadership development programs. This partnership allows the police department to build a better relationship with the community, and in turn work to reduce crime by providing kids with valuable after-school activities. 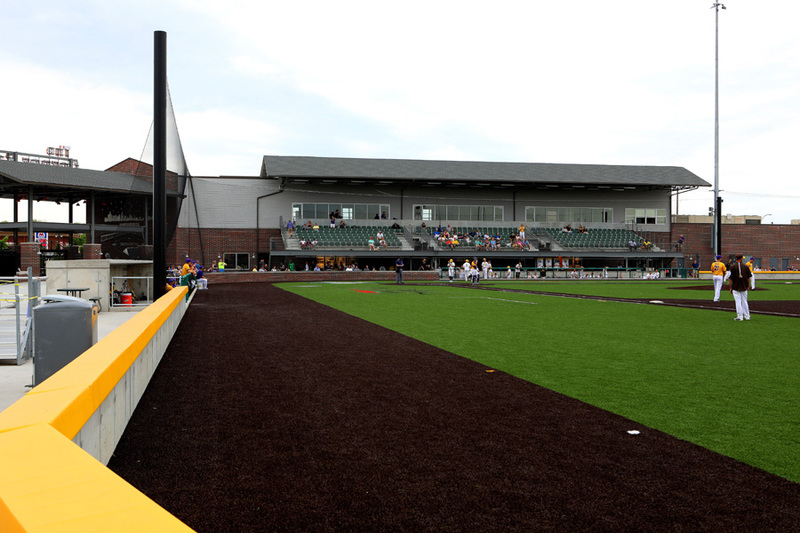 The stadium has been renamed The Corner Ballpark presented by Adient. And it just so happened that a baseball game was going on when I arrived. I stayed and watched the game for a few minutes, but it started to rain so I headed for cover. 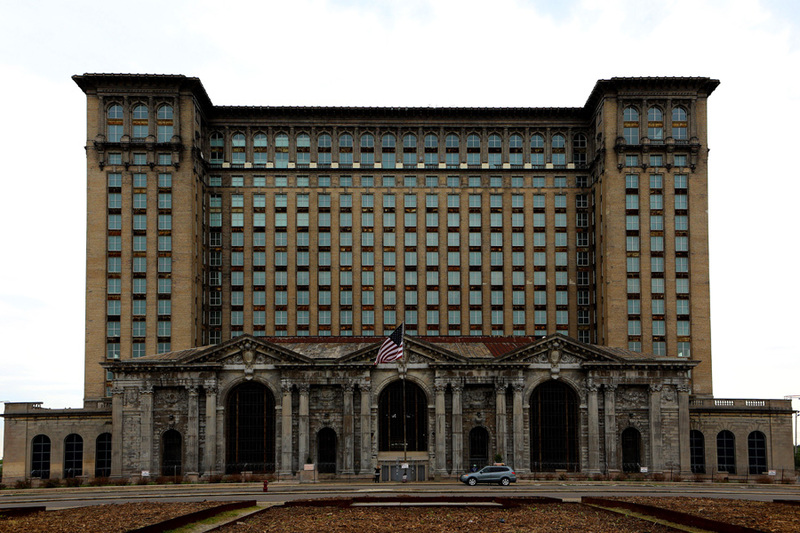 After spending a bit of time there, I head over to another Detroit landmark…Michigan Central Station. 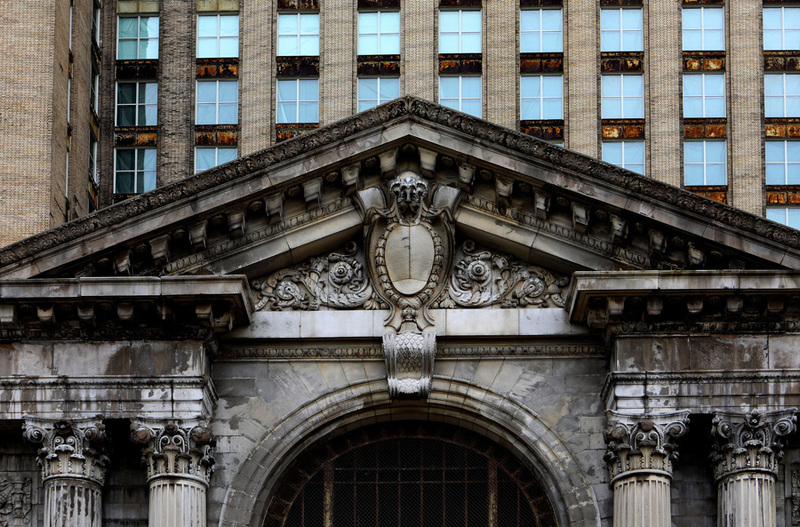 This is another “must visit” site for me when I’m in Detroit. Across the street from Michigan Central Station is a colorful mural by artists FFTY, Lahiza and Zak Meers that I thought was spectacular! 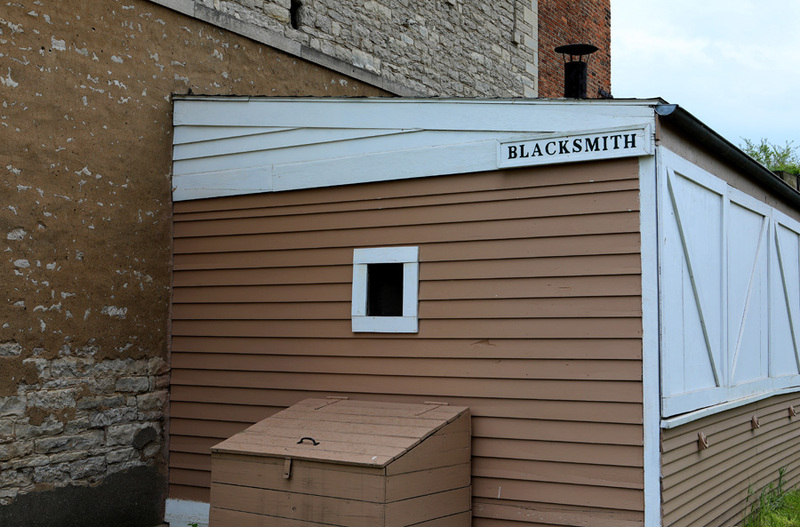 My next stop before heading to the Detroit Zoo was to visit Historic Fort Wayne. 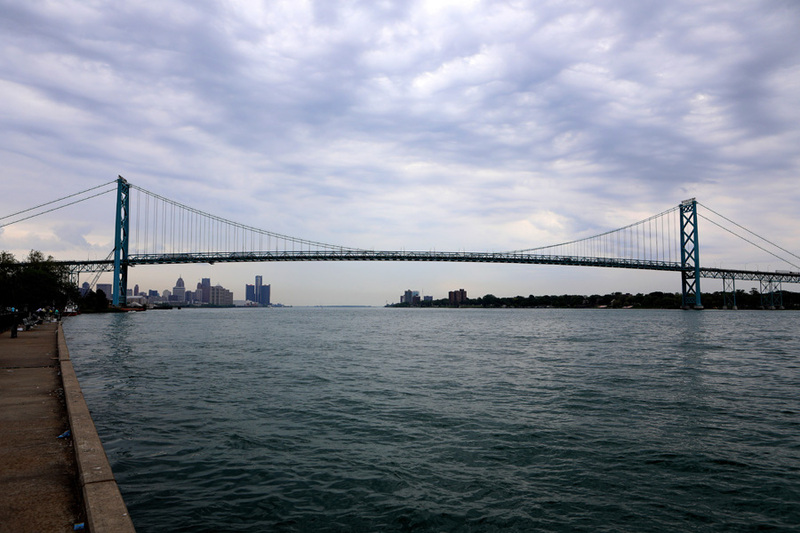 On the way, I got sidetracked because I saw a nice view of the Detroit River and the Ambassador Bridge, which is the bridge that leads into Windsor, Ontario, Canada. 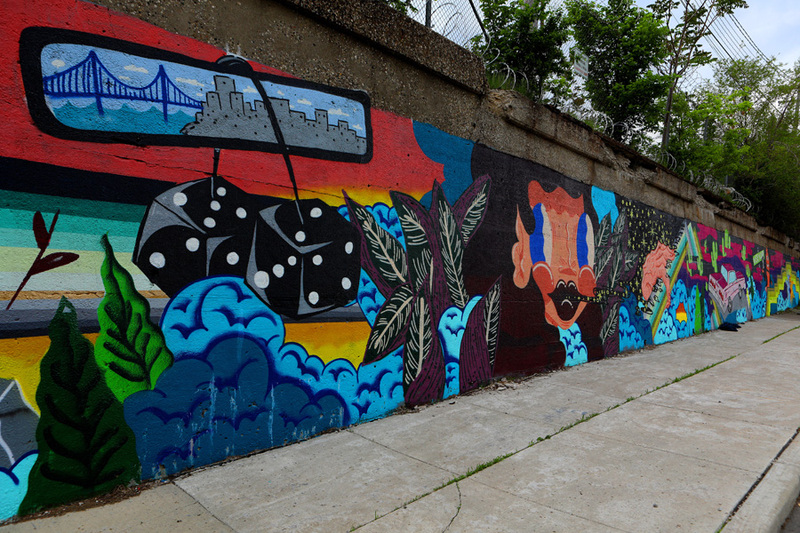 This particular area is also a site where many Detroiters come to fish. While I was there, I saw a couple of men actually catch some fish. And with the blue water of the River and the color of the bridge, that made for great photos! 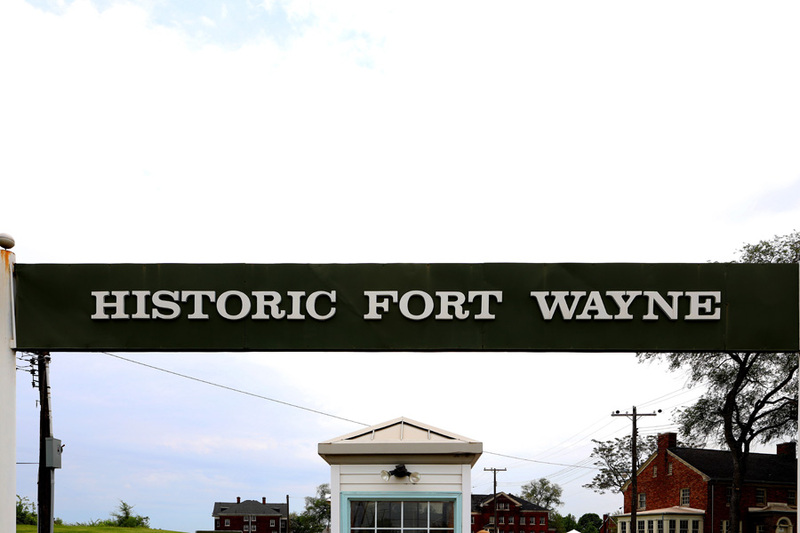 Now…on to Historic Fort Wayne. 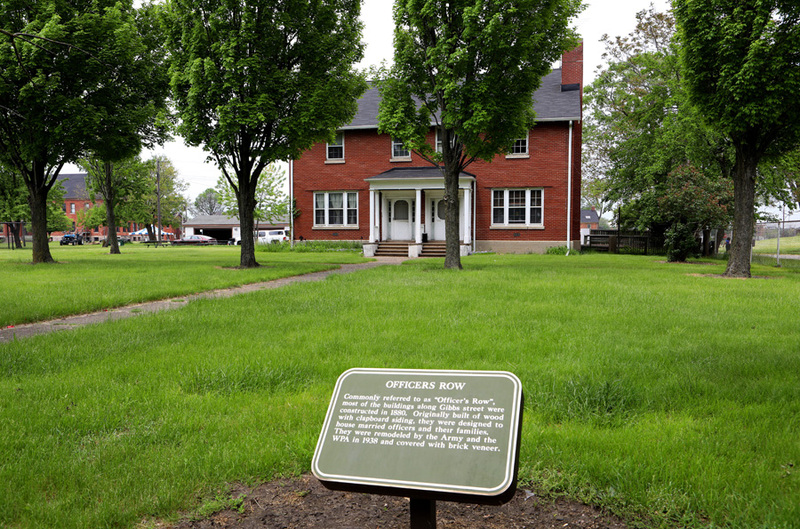 Fort Wayne is located at the foot of Livernois Avenue in the Delray neighborhood. 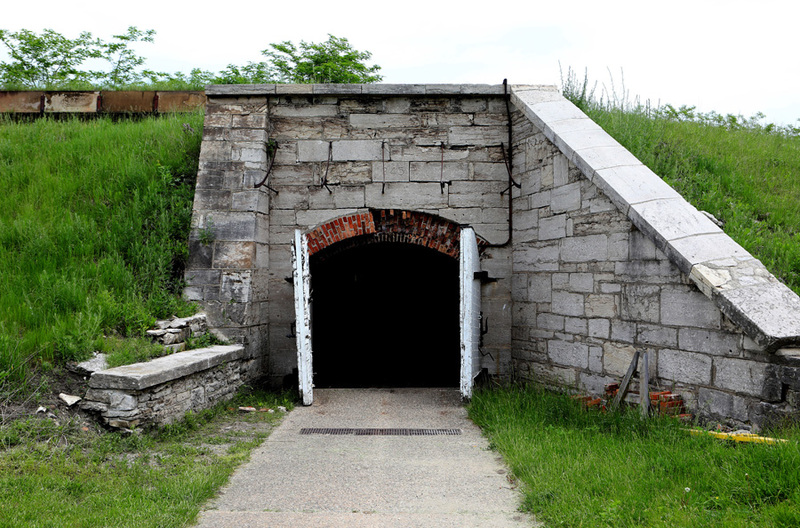 The Fort is situated on the Detroit River at a point where it is about a mile to the Canadian shore. 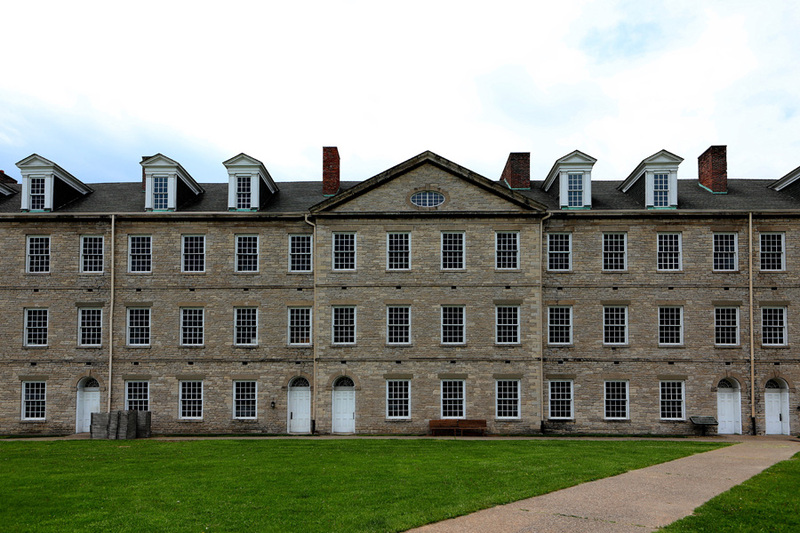 The original 1848 limestone barracks (with later brick additions) still stands, as does the 1845 star fortification (renovated in 1863 with brick exterior facing). 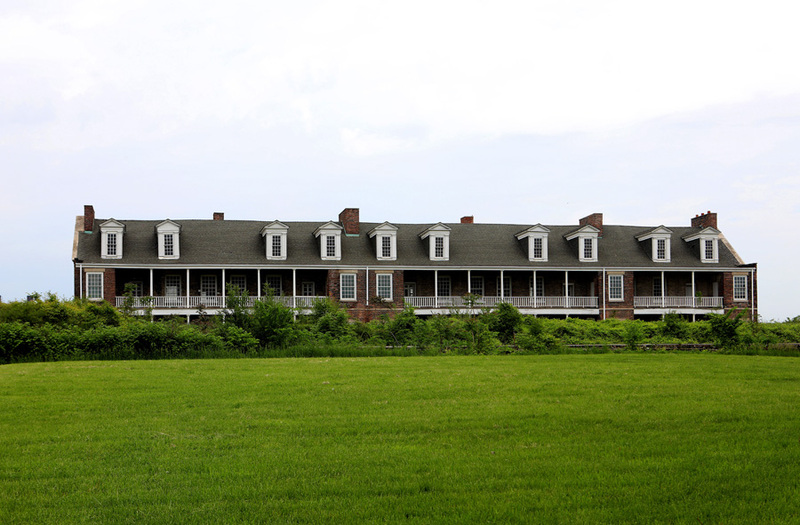 On the Fort grounds, but outside the original star Fort are additional barracks, officers quarters, hospital, shops, recreation building, commissary, guard house, garage, and stables. 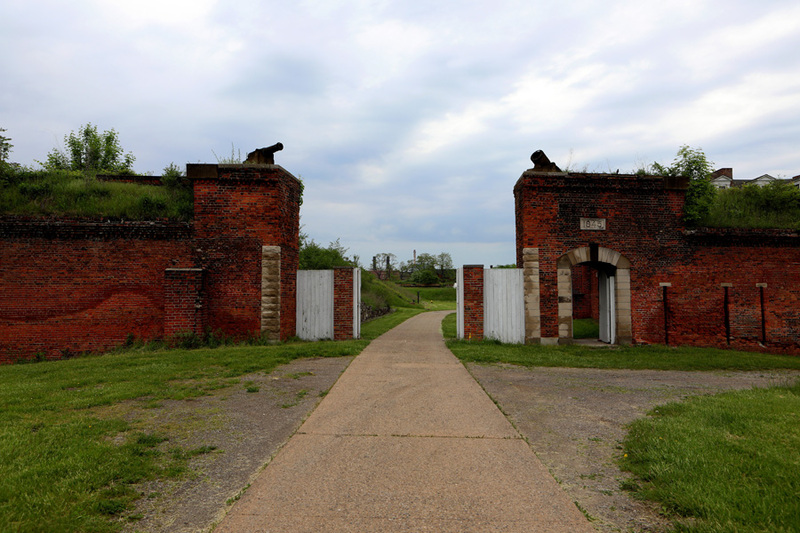 The Fort sits on 96 acres. 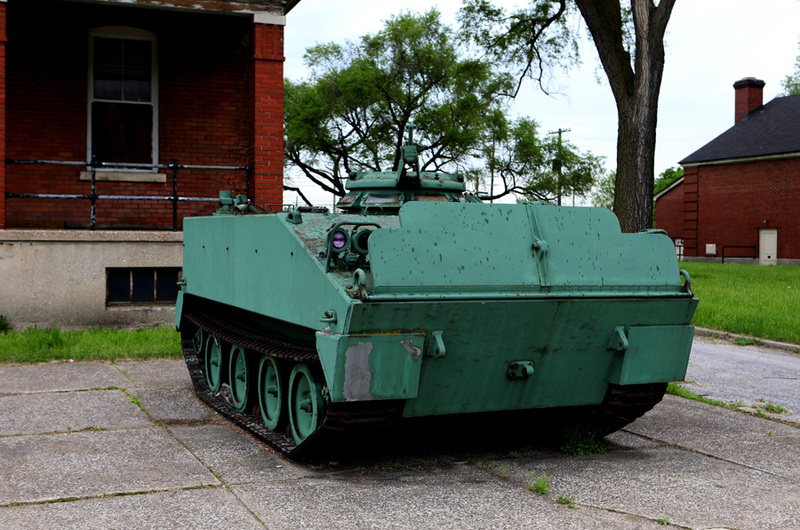 Since the 1970’s, 83 acres, including the original star Fort and a number of buildings, has been operated by the city of Detroit. 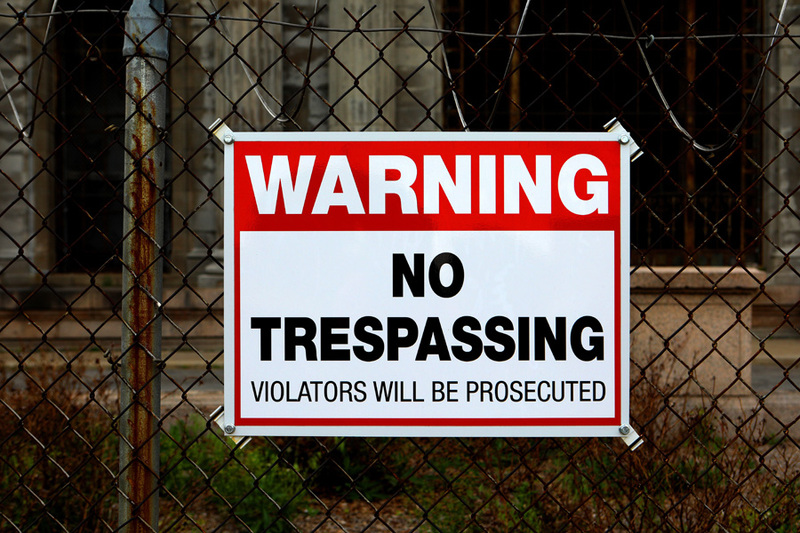 The remaining area is operated by the U.S. Army Corps of Engineers as a boatyard. 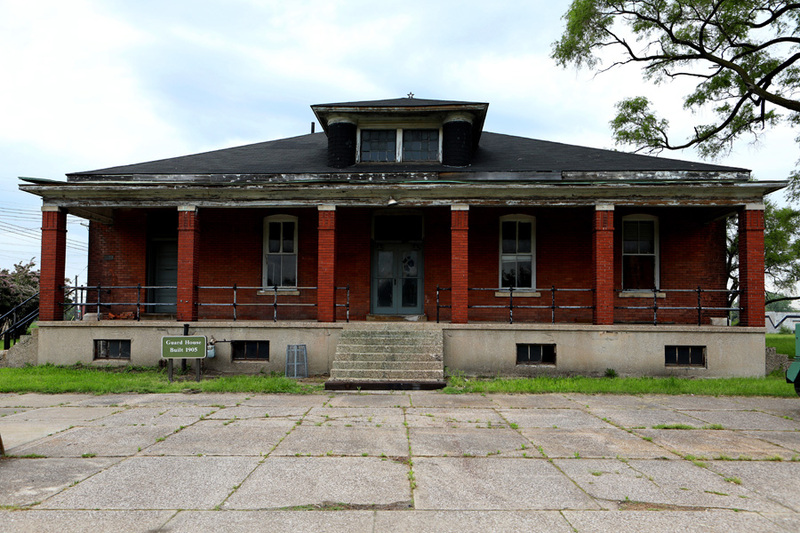 The Fort was designated a Michigan State Historic Site in 1958 and listed on the National Register of Historic Places in 1971. 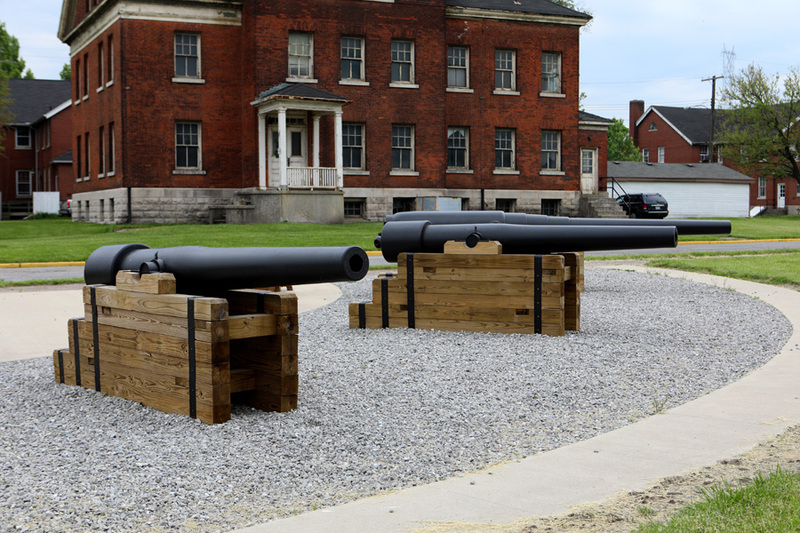 After arriving at Historic Fort Wayne, I was immediately filled with excitement! 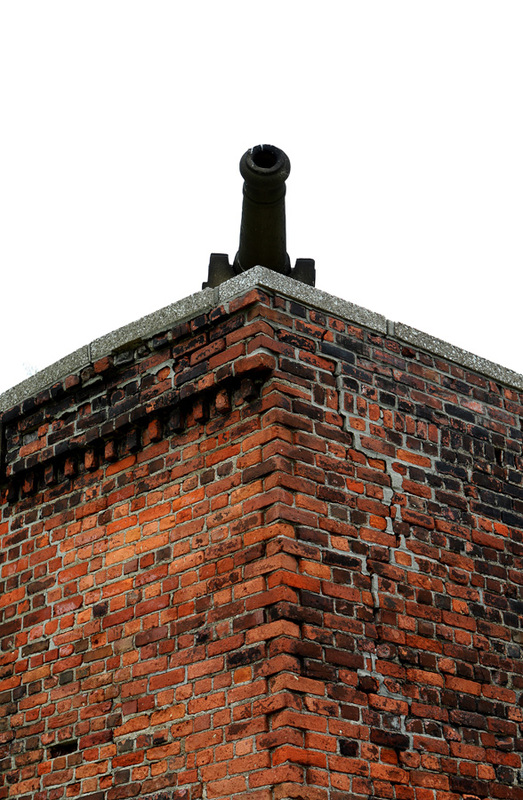 For me, it was an honor and a thrill to be standing on a site that has history dating back to about the year 1000 A.D., and also where the opening shots of the “War of 1812” were fired. 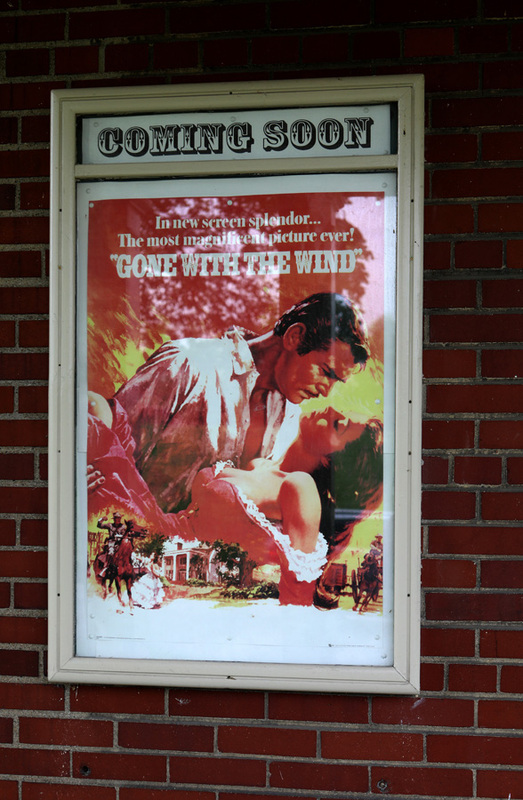 It was exciting photographing some of the original buildings…the Post Theatre, built in 1939 and the Guard House, built in 1905. 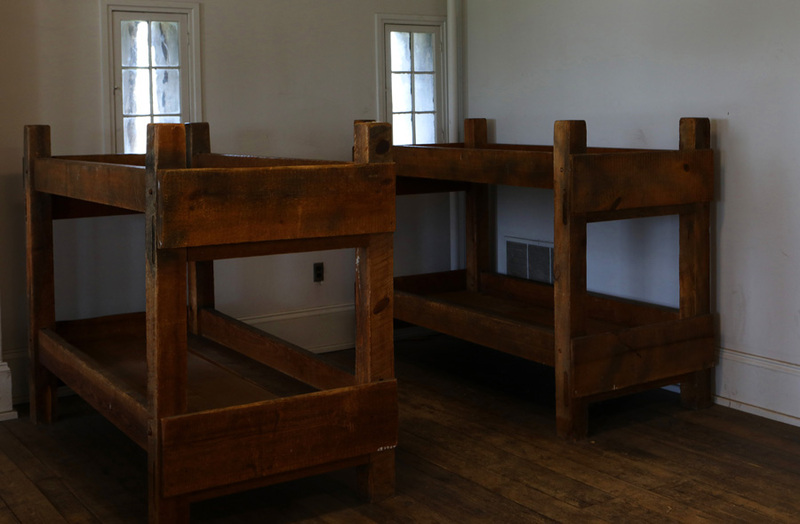 But being able to walk inside the original barracks and see where soldiers ate, slept and strategized was awesome! 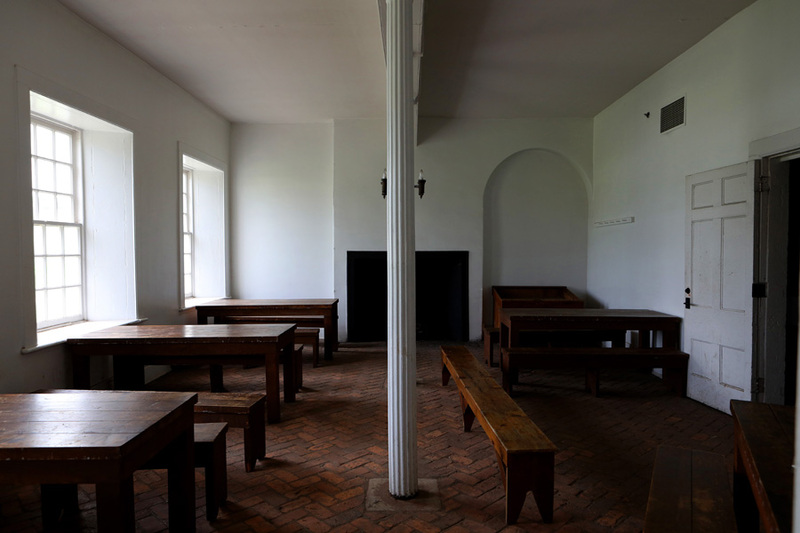 There was also a bombproof chamber and passageway built to protect defenders while the Fort was under attack. 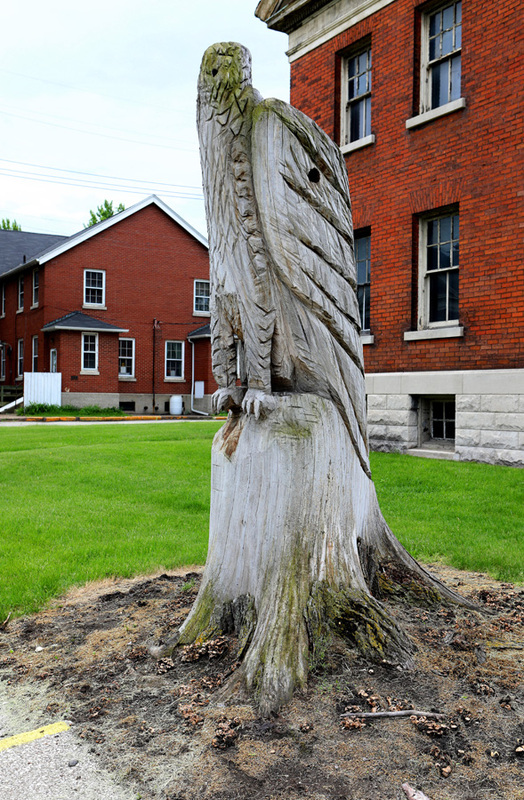 I photographed Indian Mound, one of the oldest Indian burial sites in Southeast Michigan. 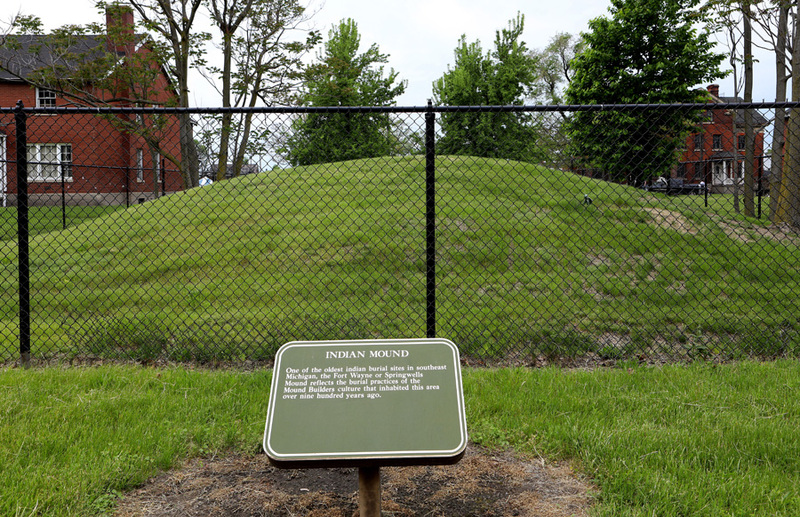 The Mound reflects the burial practices of the Mound Builders culture that inhabited this area over nine hundred years ago. 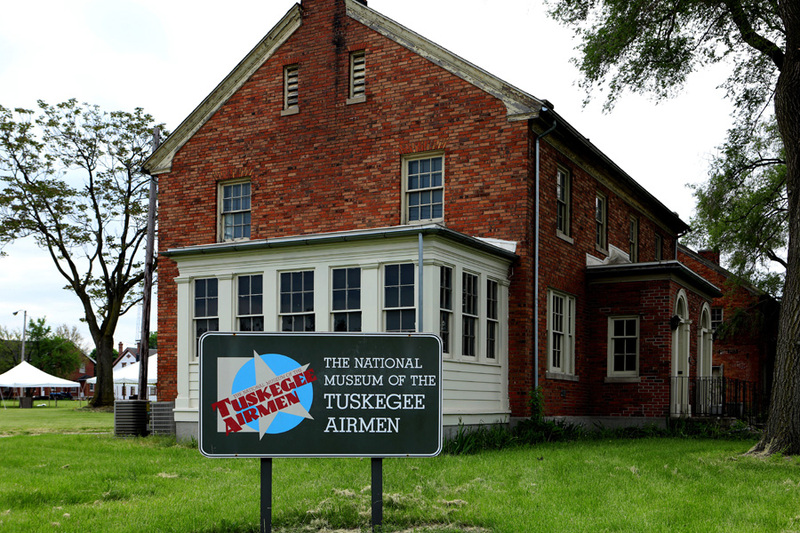 Also on the grounds of Historic Fort Wayne is the National Museum of the Tuskegee Airmen. 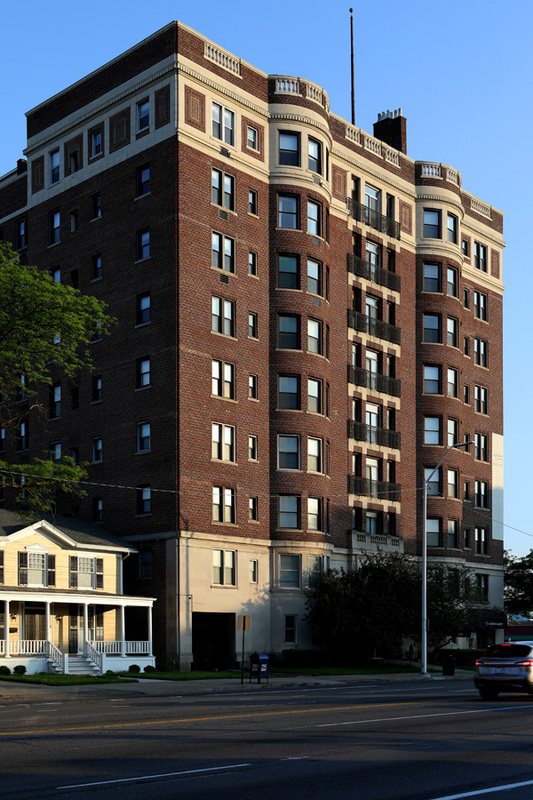 After spending hours at Historic Fort Wayne, I went to photograph the Historic Garden Court Condominiums. 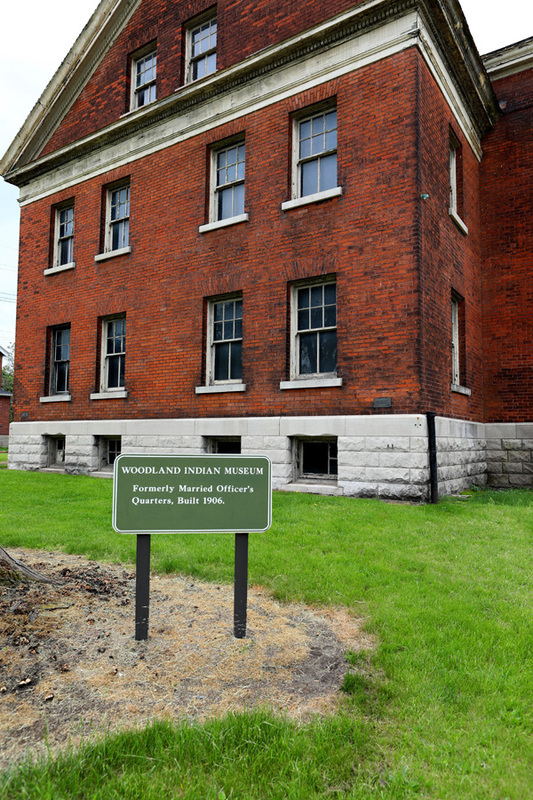 Not only is this building on the National Register of Historic Places, it is also used as the “model apartment building” for the television show “Martin”, which is set in Detroit.